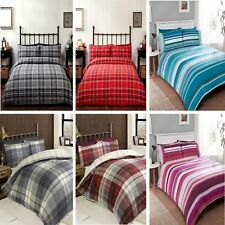 Queen Red Plaid Flannel 4 Piece Sheet Set Flat (1) Fitted (1) Pillowcases (2). Queen set includes: flat sheet (90" x 102"), fitted sheet (60" x 80" x 13") and two pillowcases (20" x 32"). Matching sheets and pillowcases for complete bedding look. 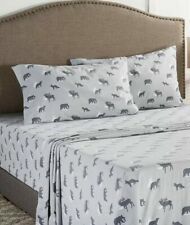 Queen Flannel Sheet Set 4 Piece Gray Wilderness Wolf Deer Moose Fox 100 % cotton Brushed on both sides for softness Machine washable size - Queen 4 pieces : * 1 queen flat sheet - 90 in * 102 in (228.6*259.1cm) fits mattresses 60in*80in(152.4cm*203.2cm) 1 queen fitted sheet - 60 in * 80 in (152.4cm*203.2cm) fits mattresses up to 15 in deep (38.1 cm) 2 standard/ queen pillowcases - 20 in * 32 in (50.8 cm * 81.2 cm) fits pillows 20 in * 32 in (50.8 cm * 77.1 cm) Color - gray background , wilderness animal print, deer, moose, bear Brand New ! 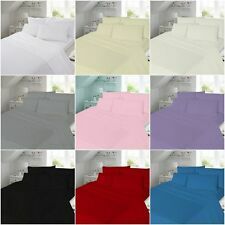 Matching sheets and pillowcases for complete bedding look. Full set includes: flat sheet (81" x 96"), fitted sheet (54" x 75" x 13") and two pillowcases (20" x 32"). Fitted sheet fits mattresses up to 15" deep. 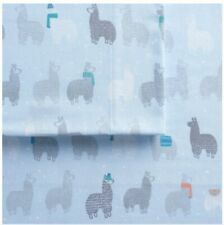 The sheets are light blue in color with various types of llamas spread throughout the sheets. 1 Standard Pillowcase--20 in. 1 Twin Fitted Sheet--39 in. 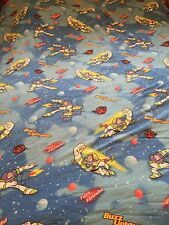 1 Twin Flat Sheet--69 in. Twin Set Includes . Flannel Pattern Pillowcases. Made of 100% cotton and brushed for ultimate. softness, the comfy pillowcases are perfect additions to any bedding ensemble. Keep warm all season long with the cozy Seasons Collection Heavyweight. Cuddle up in a flannel sheet set that is ideal for chilly temperatures! Durable, soft and cozy. 1 Queen Flat Sheet--90 in. 1 Queen Fitted Sheet--60 in. Queen Set Includes 100% Brushed Cotton. Then, place a new order for the item of your choice. Model: FLASSQU816WNTFL. Q: Are Your Prices Negotiable?. 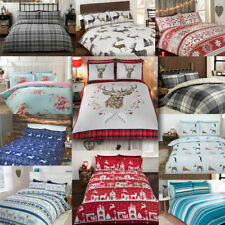 Listed today is a brand new never been open London Fog Turkish Flannel FULL Sheet Set. This has a pattern of dogs on the sheets as you can tell from pictures. 100% cotton and fits up to 15inch thick mattress. You get: 1 flat sheet 81x 96”. 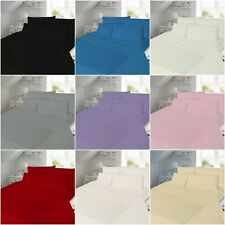 (206cm x 244cm) 1 fitted sheet 54x 75x 12” (137cm x 190cm x 30cm) Pillowcases 20 x 30” (51cm x 76cm) No returns will be accepted on this item because it’s brand new in the original packaging and you know what you’re getting and size of all the sheets/pillowcases. Thanks for looking, please message me with any questions and don’t forget to check out my other items in my eBay store! Thick "Upcycled Cotton" Flannel Sheet Set. From Portugal. A four piece premium quality flannel sheet set. The thick and soft fabric is made of plush upcycled cotton with the addition of rayon for enhanced texture and durability. Butterflies and blossoms soft snuggle flannel pillowcase. The body of the pillowcase is crafted from 100% cotton snuggle flannel fabric. French seams have been used to create this pillowcase. (All seams are encased, with no raw edges to unravel). Color:Ivory | Size:Twin XL This ultra warm and cozy Solid Flannel 4 Piece Sheet Set by Tribeca Living is perfect once the weather gets cold. The complete set includes a flat sheet, fitted sheet, and two pillowcases (one with twin sizes). Blackwatch Plaid King Pillowcases Heavyweight Flannel in Navy Green set of 2 NEW. Flannel Pattern Pillowcases. Made of 100% cotton and brushed for ultimate. softness, the comfy pillowcases are perfect additions to any bedding ensemble. Vellux Grey Flannel Queen Sheet Set A cozy flannel , this sheet set will keep you warm through all the cold nights. 65% Cotton 35% Polyester Set Includes: 1- Queen Flat Sheet For 60" X 80" Mattress (152 X 203 CM) Finished Size 90" X 102" (228 X 259 CM) 1- Queen Deep Fitted Sheet For 60" X 80" Mattress (152 X 203 CM) 15" Pockets Fit Most Mattresses Up To 18 Inches Deep 2- Standard Pillowcases For 20" X 26" Pillows (50 X 66 CM) Finished Size 20" X 30" (50 X 76 CM) New-First Quality ! If you have any questions, please feel free to contact me. I am always glad to combine shipping! Thanks for visiting Lynn's Linen Loft!. Heavyweight Flannel Sheet Set, size King. (5 ounce flannel). Navy Blue. Set includes 1 flat sheet (108" x 102"), 1 fitted sheet (78" x 80") and 2 king pillow case (20" x 40"). Queen sheet set includes 90" W x 102" L flat sheet. 60" W x 80" L fitted sheet. Machine wash.
Micro flannel is luxuriously soft and warm. Micro flannel does not shrink, is anti-pill, resists wrinkling, and fits deep pocket mattresses. Micro flannel is energy saving because it is fast wash and quick dry. FAB INDUSTRIES ELEGANT FLANNEL CASHMERE FEEL 20X30 PILLOW CASE. Condition is New with tags. Cabana stripe in colors of gray, tan and teal. Peri Kids Burgundy Flannel Standard Pillowcases. GRAY BACKGROUND WITH DOG PRINT. Machine wash (wash before using). INCLUDES FITTED, FLAT SHEETS AND TWO PILLOWCASES. 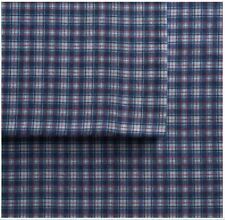 100% cotton snuggle flannel fabric. Aztec feather design on a mint green background. Fits a standard 20 X 26" pillow (pillow not included). Provides ample pillow coverage. 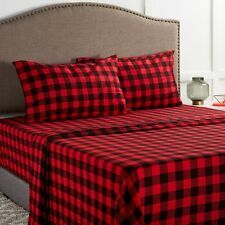 Lands End Triple Brushed 5 oz King sized flannel sheet set in Creole Heather. Woven with heavier yarns for extra loft and coziness. Extra Deep pockets and all around elastic to the fitted sheet for a better fit and flat sheet is longer than standard to stay neatly tucked. Seasons Collection Set of 2 KING Heavy Weight Flannel Pillowcases Ecru 20" x 40"
Premium Quality by Dormisette. hose of us who own one of Dormisette's. I sincerely believe that anyone who likes flannel would be thrilled with Dormisette. This exceptional flannel i s made in Germany by leaders in the world of bed linens. Cotton Flannel Sheet set. 80% Cotton, 20% Rayon derived from Bamboo luxurious, sustainable and durable. Color; Ivory. 1 108" X 102" King Flat Sheet. 1 78" X 80" King Fitted Sheet (Fits up to 17" Mattress). The Winter Nights cotton flannel sheet sets are available in a variety of colors and prints to brighten up your bedroom. Model: Bed Sheet Set. Flat sheet. Fitted sheet. Q: Are Your Prices Negotiable?.